One number 1. Three number 2s. Three number 3s. Nine other top 20 singles. 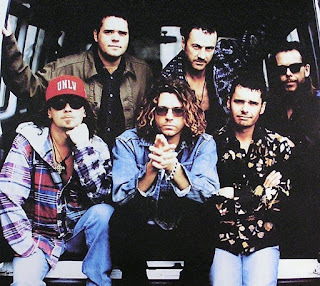 INXS had enjoyed an illustrious career on the ARIA top 50 in the '80s and early '90s. And this week in 1993, they added one more top 20 hit to that tally. But it would be very much a last hurrah for the world-conquering Australian rock band, who never returned to the top 20 during singer Michael Hutchence's lifetime. There was no change at number 1 this week in 1993 as Meat Loaf stayed put with "I'd Do Anything For Love (But I Won't Do That)" for a sixth week. Although a top 20 hit in the UK, this third "Sign Your Name"-ish single from Symphony Or Damn failed to connect locally, barely making the top 100. Two weeks after "Nothingness" made the top 100, this more memorable - thanks to its playful lyric - single from Living Colour's Stain album took its place on the chart. 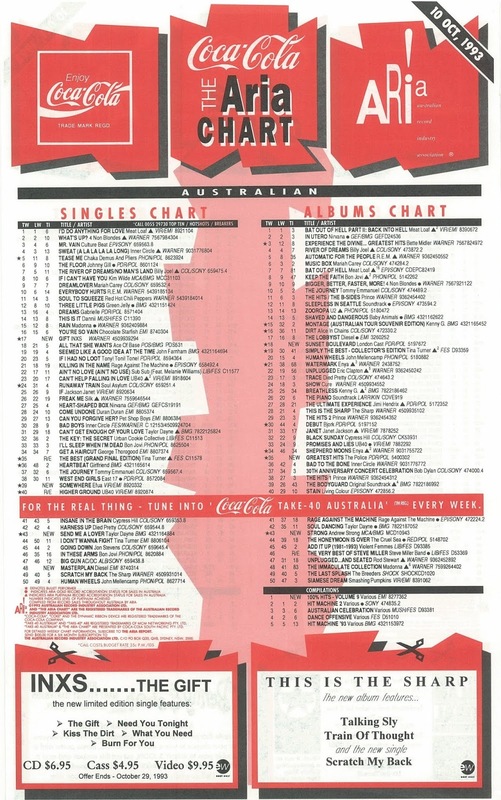 While INXS still had one more big hit in them, this other Australian band that'd been successful since the early '80s faltered with the lead single from Big Wheel and never managed to make the top 50 again. After back-to-back top 10 singles, this beautiful ballad written by Gerry DeVeaux and Terry Britten was an unexpected flop for Lenny Kravitz, but he wasn't quite done with the Are You Gonna Go My Way album. This was an EP of live tracks (including an instrumental intro to their show) to coincide with the release of concert album Show - one of two live albums released by The Cure in late 1993. He'd managed four top 20 hits from debut solo album Hepfidelity but it looked like Diesel was only going to manage the one from follow-up The Lobbyist when this second single tanked in the 40s - and, as we'll see in coming months, that would end up being the case. I can see why "Masterplan" wasn't one of Johnny/Mark's better performing singles - it felt languid and meandering compared to the urgency of his most successful tracks. Here's another song that stalled at number 42 from a singer who was sometimes used to doing much better, especially recently with her version of "Can't Get Enough Of Your Love", which celebrated its 18th week in the top 50 this week. As she often did, Taylor switched from dancefloor-friendly party track to big ballad with this second single from Soul Dancing - a song that had previously been recorded by Celine Dion during the sessions for her 1992 self-titled album (and would end up being released in 1994). I can't say I've ever been a massive fan of "Send Me A Lover" - too slow, too melodramatic - but it did much better than the two subsequent singles from the album, which missed the top 100 completely. In a week of former hitmakers failing to live up to former glories, it's fitting that the new entry that would end up being most successful was from a newcomer. Somewhat of an oddity with its bathroom gossip monologue verse and nursery rhyme-ish chorus, "Somewhere" was the only hit for Efua Baker, who, as well as being a dancer, model and fitness expert, is married to Soul II Soul frontman Jazzie B.
Technically a re-entry, but it's worth covering this just to ask how many times we had to put up with this song on the chart? Not content with having subjected us to a new version of "The Best" with Jimmy Barnes in 1992, Tina Turner's 1989 smash returned to the top 50 for a three-week run in the wake of her performance at 1993's NRL grand final - the singer having had a lucrative relationship with the football code for some years. A brand new INXS song usually meant a high-flying chart debut. "What You Need" had debuted at number 5, "Need You Tonight" and "Heaven Sent" both entered at 13, while "Suicide Blonde" arrived at number 6. Slightly down from those positions but still an instant top 20 hit, "The Gift" kicked off the Full Moon, Dirty Hearts era. An angry blast of rock, the song wasn't the most commercial thing the band had ever released, which may explain why it only climbed one place higher before departing the top 50 relatively swiftly. The song did, however, prove that INXS were moving their sound forward in an era when angsty grunge was dominating. But did anyone want INXS to go grunge? 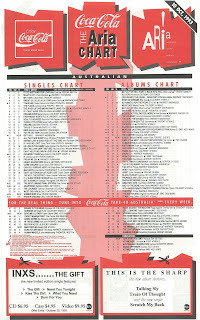 Charts and sales figures would suggest not as many people as had previously bought their music, and this would end up being the band's final top 20 single while Michael Hutchence was alive. Next week: another massive local band returns with a new album, plus three 1993 classics - one Eurodance anthem, one hip-hop chart-topper and one R&B mash-up. The only place I heard/saw 'Delicate' at the time was on the rage new releases show, aired in the wee hours of Friday morning back then. It deserved to do better. 'Heaven Help''s floppage was a bit unexpected. 'Send Me a Lover' is pretty bad IMO. Kind of like it was written for an Idol/X-Factor winner. It's interesting that the Efua single was much bigger here than it was in the UK, or anywhere else for that matter. Before this, she had appeared as an extra in quite a few music videos. Not being from NSW, I've never quite understood exactly how or why Tina is so closely associated with rugby from this era. Or why 'The Best' kept charting in its various incarnations. When it re-appeared in the rage top 60 in '93, I remember being perplexed as to why. It seemed like there was nothing INXS could do to propel themselves back to a 'Kick', or even 'X', level of success. Part of their problem was being seen as an 80s act, probably. They seemed very 'old hat' by '93.